I love Formlabs but I feel like their removal jigs are a joke. The original Form 1 tray sort of worked if you clamped it down. I don’t bother with the Form 2 removal jig as I find it too unstable for comfort. I’d like to create a build platform holder that’s permanently affixed to my desk. I figure it should swivel 360° so I can work on any side (45° increments would be fine), and have a strong locking mechanism to keep the platform from spinning freely once I start levering parts off and torquing corners. Perhaps a miniature version of this? Has anyone seen any off-the-self hardware that might work for me (fully assembled locking turntable, or components I should check out)? Right now I’m looking at thrust bearings and some kind of spring-loaded locking pin mechanism. 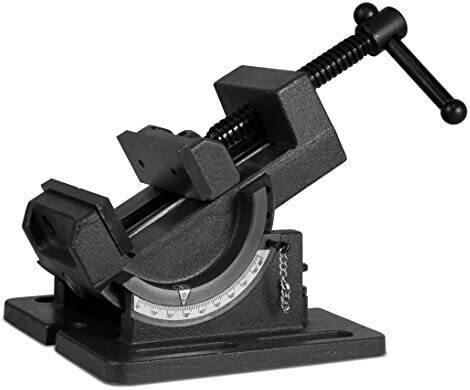 Just buy that simplex turntable and drill holes thru the jig that came with your Form 2 and mount it permanently on the turntable. Unfortunately I don’t have the workspace to accommodate that Simplex. It’s about twice the size I need. Also I find the build platform pops off the stock jig too easily if you get into an orientation where you’re scraping toward the release direction. Wood carvers often use a vise which rotates like that. They come in a variety of sizes. You could probably print an adaptor to connect the build platform’s clamp to the top of one of these. @mgarrity Do you think one with a ball joint like this would be rigid enough? Being able to tilt as well as rotate would be a big advantage. Yes, a lot of the carving vises have ball joints so that you can get into all the funny angles. I would say that it’s a question of how much force you use when you’re removing parts. If you’ve got a lot of parts with big rafts, you might need a really beefy ball joint clamp. I often have direct-on-base parts requiring a LOT of force. 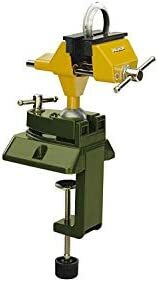 Buy mobile Work Positioner / Ball Vise designed to make welding, soldering, or polishing or any other hand assembly work easier and more efficient. Don’t suppose anyone here has seen one of these before and can comment on it? I like that it’s self-locking with a single lever to release all axes. But at $500 it’s pretty expensive. And milling vices (like https://www.linear-tools.com/tools/two-way-tilt-swivel-machine-vices.html), although I don’t think those will work as they always swivel in the horizontal plane, and I want it to swivel around the axis of tilt. BTW can someone explain why the milling ones have inordinately giant chunks of metal built into one side of their jaws? Is that supposed to be a counterweight or work surface or something? The jaws open up just enough to comfortably insert the connection “armature” of the build platform into the rubber grips, so there’s no need to make a jig. Tightening them provides a firm grip onto the platform without crushing or deforming the armature. The desk clamp is removable so you can permanently mount it. The only issue is the ball joint might not be a secure enough mechanism for my needs. I had to tighten the joint down pretty hard to avoid slippage from banging my hand moderately against the side of the platform. We’ll see how it fares during part removal (where forces might be a little higher). After installing it, I realized that for difficult removals I can probably position it to hold an edge of the platform braced against the desk, which should help counter the force from my removal tools. Also the thick rubber cushions provide some dampening, so there’s a bit of wobble when you impact with a tool (e.g. if you’re “chiseling” a blade). But I think I can work with that. If anyone’s interested I can report back after a few uses. One of the devices in use at Formlabs is a homemade (“internally engineered”?) wooden construction with a U-shaped channel (both in profile and overall shape) that holds 3 of the 4 flange edges of the build platform, at a 45-degree angle. That way, you can drop a build platform in with any of the 4 sides up, and then go at stubborn prints with a scraper, chisel, dead blow hammer, razor blade, or whatever, and quickly adjust to a different side with no clamps to loosen or tighten. I’ll post a picture of it tomorrow - please remind me if I forget. @Ike Nice, that makes a lot of sense. I think it beats my clamp. Do you ever wish there was a 45-degree version and a 0-degree (flat) version? @rkagerer resin build-up in the channel seems very slow. I don’t know how often my co-workers wipe it out, but I’ve only had to clean it a few times myself. Sometimes the angle doesn’t seem quite perfect, but I do not find myself wishing for a 0-degree or a 90-degree version.